TWENTY-FOUR years ago, there was Viva Films’ “Bagets,” the coming-of-age movie directed by the late Maryo J. delos Reyes and written by the late Jake Tordesillas, about five middle-class boys going through the cusp of adulthood. Later on, the word “bagets” entered the Filipino lexicon, becoming synonymous to youngsters aged 1 to 18. 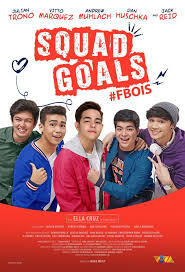 Now, Viva is readying “Squad Goals #FBois” for five bagets – Julian Trono, Vitto Marquez, Andrew Muhlach, Daniel Hushka, and Jack Reid.